It’s time once again for a recap of this month’s post on facebook, and we have some good ones for you. How about a celebration of five and a look at several mathematical artists. This month marked the five-year anniversary for Math Munch! Thank you so much to our readers for sticking with us. In honor of the occasion, check out these awesome Numberphile videos, each related to the number 5. There’s the 5 Platonic solids, of course, or Euclid’s 5th postulate, or a fifth-root trick, or even 5 and Penrose tilings. Click on the links to view, or scroll to the bottom of this post. Up next, meet Timea Tihanyi and Jayadev Athreya. They are a visual artist and mathematics professor, respectively, and the two of them are coming together for a math-art collaboration called Axiomatic. Geek Wire wrote a nice article about them here. Give it a read. Sadly, there aren’t many images yet, but we hope to see more from this team soon. Finally, We’ve seen our fair share of mathematical fiber arts here on MM. See these previous posts for some mathematical knitting and crochet. Well I had to share a recent writeup by The Guardian on two mathekniticians, a married couple featured here before: Pat Ashforth and Steve Plummer. Read the article. It’s chock full of great images like the one to the left. Well that’s it for this week’s Math Munch. See you next time, and bon appetit! It’s the final Thursday of September, so it’s time again for a recap of the month’s best from our Facebook page. This month we have a new sort of dice, a beautiful illustration of a numerical fact, and some wonderful new sculpture work from Rinus Roelofs. Let’s dig in. First, check out this wonderful image. Meditate on it, and see if you can figure out what’s going on, even if you can’t understand the notation. It’s showing us a simple way to compute a sum of cubes. They can be broken down and reconstructed as a square! Consider the sum of the first 3 cube numbers, for example: 1+8+27=36, and 36 is the square of 6. One step further, 6 is the sum of the first 3 numbers. So in the picture above, the sum of the first 5 cubes is equal to the square whose side length is the sum of 1 through 5. AMAZING, and a beautiful illustration. Can you see why it always works, not just for 1 through 5? That’s key! And now test your understanding: What is the sum of the first 100 cube numbers? Up next, we’ve met Henry Segerman plenty of times on Math Munch, including a look at the project he shares with Robert Fathauer, called The Dice Lab. They make mathematically interesting dice that have, in most cases, never been produced before. There newest creation (also last? see the video to see what I mean) is a 48-sided dice. Very cool. Can you think of a use for a 48-sided die? It sure looks cool. Reminds me of a rhombic dodecahedron. Do you see the connection? Finally, another familiar face – the incredible mathematical artist, Rinus Roelofs – has been making incredible things. We met Roelofs in July, but his facebook page has been full of activity since then. 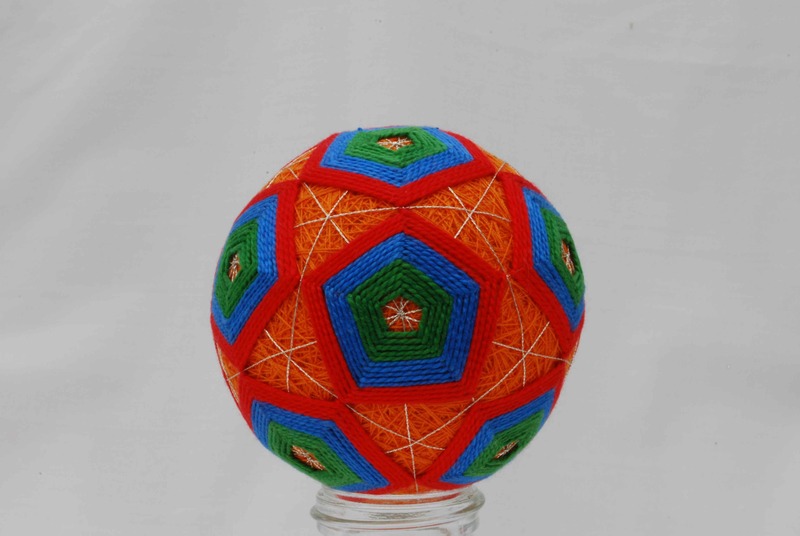 His recent work has focused on double-covered polyhedra. You’ll have to click over and browse to see what I mean. Recently he posted a project I might want to take on. These are fold-up models for his creations. Check out the gallery below. I’m not 100% sure how that cube one works, but I think I can figure it out, and I bet some of you can too. Of course, I’m sure we’ll make mistakes, but if we keep on learning, I bet we can get this figured out. If anyone ends up making a template of their own, email it to us and we’ll share it on the site. Now onto the main course. I have to show you this incredible new math art tool called SLICEFORM STUDIO. Click over and check out their gallery to begin with. Just gorgeous. There’s a tutorial page as well, but the best thing to do is probably just to start playing with the app itself. DIG IN! The site is sort of made for people who can use laser cutters to do the paper and stuff, but you can also just click “trace and export strips” and then color it in and export the image. On the right, you can see my first creation. Email yours to mathmunchteam@gmail.com and we’ll stick it in our readers’ gallery. I follow Rinus on facebook, and he’s always posting pictures of his works in progress, and they are stunning. First, check out this gallery of Interwoven Ring Patterns he recently posted. Then take a look at his timeline photos. Lots of overlapping patterns and Möbius shapes. Finally, have you ever heard of Galaxy Puzzles? I hadn’t either, but you can find lots of them over on the wonderful puzzling site, krazydad. The puzzle begins with lots of dots, and your goal is to separate the dots by making enclosures that have 180 degree rotational symmetry. Print and play galaxy puzzles are available as well as an interactive online version. There are lots of other puzzles available as well, but I think Battleships is a pretty cool. You might give that a try too. But wait, there’s more. With 5 Thursdays in a month, there’s just lots to share, so you also get some bonus stuff! That’s it for June. See you next time. Bon appetit! Welcome to this week’s Math Munch! For the final Thursday of May, we’ll be looking back at some of this month’s posts from our Facebook page. We’ll see some wordless videos by The Global Math Project, look at a prime number quiz game, and meet Fan Chung Graham, one of the world’s leading mathematicians. I don’t know much about The Global Math Project, but I know James Tanton is involved, and that is always a good thing. (Remember his Exploding Dots?) Well, they’ve posted a couple of wonderful videos featuring Tanton’s “math without words.” Need I say more? See for yourself. If you like those, here are some more math without words from Tanton’s website. It’s good practice for divisibility tests and getting your prime recognition up, but I suppose it’s not all that mathematical, is it? But Christian did something interesting. He recorded data from all the games played, and he wrote a summary of the results. I love all the charts and graphs in there. The one below shows how likely a number is to be missed by players. Finally, I hadn’t heard of Fan Chung-Graham until I found an interview of her posted on Facebook. She is one of the world’s leading mathematicians in several fields, and though she recently retired, she still conducts some research. The interview is a little academic, but it’s still nice to get to know such a talented mathematician. Well that wraps up the week and month. I hope you’ve found some tasty math. Have a great week and bon appetite!